NEW are articles and discussions written about the Al Khamsa Arabian horse and its history, how to evaluate information about it, how to set up a breeding program in a preservation breeding tradition, an annotated bibliography for further explorations.NEW is an expanded presentation of the Al Khamsa database of 30,000 horses, current to 3/31/2007, on CD, with all the bells and whistles available through computer technology: extended pedigrees, generations of descendants, pedigree notes and all fully linked for easy usage. No special programs required. 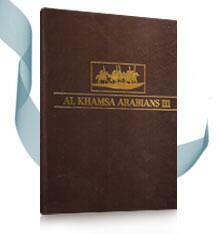 A Documentation of Al Khamsa Arabians and their History. NEW are articles and discussions written about the Al Khamsa Arabian horse and its history, how to evaluate information about it, how to set up a breeding program in a preservation breeding tradition, an annotated bibliography for further explorations.NEW is an expanded presentation of the Al Khamsa database of 30,000 horses, current to 3/31/2007, on CD, with all the bells and whistles available through computer technology: extended pedigrees, generations of descendants, pedigree notes and all fully linked for easy usage. No special programs required.NEW is the addition of COLOR. A color section of photos will present the Al Khamsa Arabian today in its best light. CLASSIC is the quality of information you expect from Al Khamsa, Inc.